Dividends, Dividends, Dividends - Valuentum Securities Inc.
Valuentum's President of Equity Research Brian Nelson shares three unique insights on dividends not commonly discussed among investors. ~5 mins. If you cannot view the video below, please select the link here or view the transcript as follows. Originally published September 10, 2014. This is Brian Nelson from Valuentum Securities. I wanted to share with you three insights on dividends that I don't think are talked about enough in today's dividend growth investing handbook. The first is the idea that the dividend is a symptom of a company’s strength so the key driver behind a firm's valuation is its free cash flows, and the dividend is a symptom of the company being able to continue to generate those free cash flows and to pay a portion of those cash flows to shareholders. 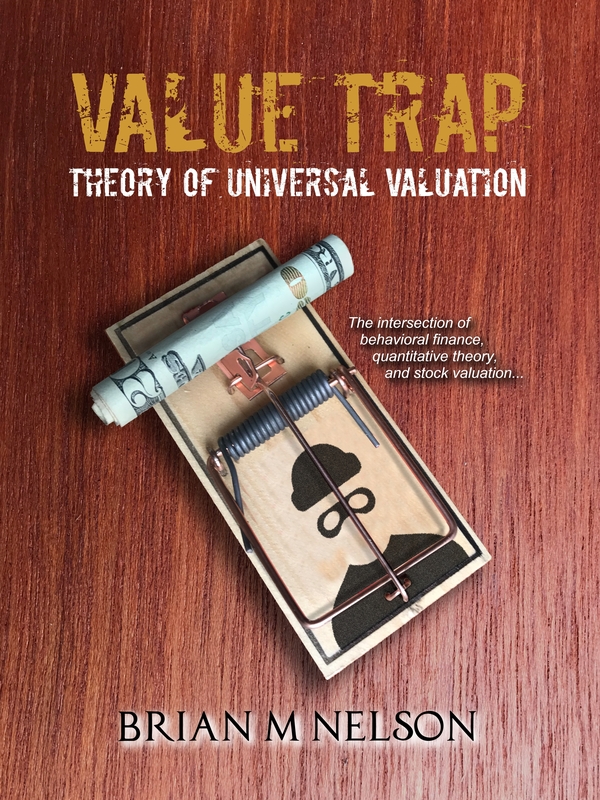 So it's important to remember as investors that the driver behind a business’ valuation is its free cash flows, and the dividend is a symptom those cash flows. The second point I wanted to highlight is the idea that a higher yield isn't always better. In many cases, a higher yield is a greater reflection of a company's risk regarding the sustainability of the payout than anything else. For stocks that pay out a large portion of their earnings and free cash flows as dividends, these are essentially income vehicles, fixed-income vehicles in some cases, and many times their equity prices, their stock prices, reflect that particular fixed-income nature. If we think about it in terms these higher-yielding dividend (paying) companies, those that (yield) 9-10% or above, they’re in many cases, they're priced similar to higher-yielding debt, where for a debt instrument the spread over the Treasury would have to be wider -- debt investors would demand a higher yield on a debt instrument in order to hold that debt security due to the risk of default. It is similar with respect to dividend growth investing in high-yielding companies where for a stock investor to hold a particular stock that is somewhat risky with respect the payout, they demand a higher yield, and that's why you see companies with higher yields have a greater likelihood of cutting those dividends because the market is assessing the risk regarding the payout and demanding a higher yield (lower stock price) in order to take on that particular risk. The third point that I think is worth highlighting is the origination of the dividend, and that could come from three particular sources. The first is free cash flows -- this is cash flow from operations, which is driven in part by net income (earnings), and then of course the working capital changes that lead into cash flow from operations, less capital expenditures, both growth and maintenance “capex” to propel future cash flow from operations and earnings. Cash flow from operations less capital expenditures is going to be free cash flows, that which a business has left over after investing into its business to continue that earnings trajectory. So that's one source where cash can come from the company in terms of the paying a dividend. The other source is net cash on the balance sheet. For example, a company that may have a cash or earnings shortfall in any given period could go to its balance sheet to pull cash from the balance sheet to pay shareholders the dividend. This is why we pay very close attention to the balance sheet because it is a very important source of dividend strength and growth potential. Then finally, more or less as it relates to companies that pay out a large portion up their particular earnings and cash flow as dividends. A company's ability to access the capital markets -- debt and equity markets -- is vital to the continuation of paying out a particular dividend (distribution). If, for example, a high-yielding company that is dependent on the capital markets, if that access to capital is shut off, they are at a greater likelihood of cutting their particular dividends -- and you'll see this within our (dividend) methodology framework for business structures such as REITs and master limited partnerships (MLPs). 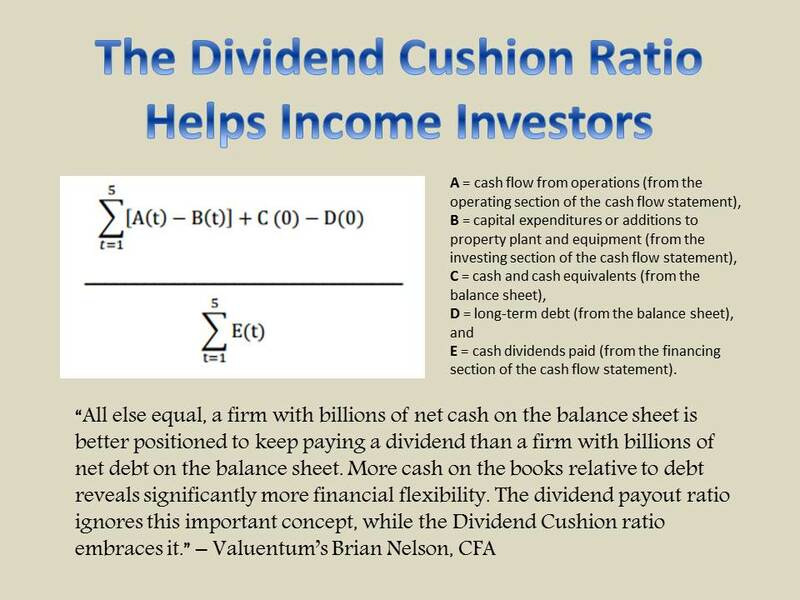 So, these particular dynamics in terms of the origination of the dividend -- free cash flow, the net balance sheet, access to the debt and capital markets -- roll into the Dividend Cushion ratio. This ratio helps us assess the safety of a particular dividend, and the higher the ratio above 1, the “safer” the company's dividend assuming that it does have access to capital markets. Learn more about our dividend reports here. Tickerized for the highest-yielding companies in Valuentum's coverage.